Home � D23 Expo , Disney News , Disney World Expansion , Disney World News , Magic Kingdom , Magic Kingdom Attractions , New At Disney World , Tron Legacy � Magic Kingdom Will Be Getting New Tron Attraction In Tomorrowland! Magic Kingdom Will Be Getting New Tron Attraction In Tomorrowland! Disney has announced that the Magic Kingdom in the Walt Disney World Resort will be getting the highest rated attraction from Shanghai Disneyland - TRON Lightcycle Power Run. The rumors are true and this amazing attraction will now be accessible to the millions of visitors to Disney World in Orlando, FL. Bob Chapek, Chairman of Walt Disney Parks & Resorts, made the announcement during the Walt Disney World Parks and Resorts presentation at D23 Expo 2017. Unlike many of the other recent attraction announcements, the TRON ride will not come at the expense of a current Magic Kingdom attraction. As shown in the artist's rendering above the new TRON attraction will be located in Tomorrowland next to Space Mountain without impacting the Tomorrowland Speedway! 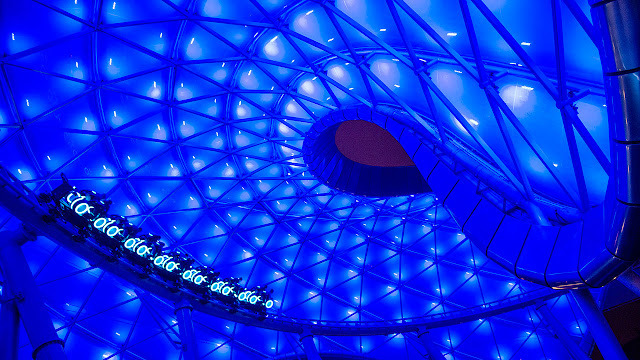 The current TRON Lightcycle Power Run in China is a coaster like attraction where guests board a train of two-wheeled Lightcycles that follow the track that puts Disney guests into the movie TRON Legacy and its high-tech universe. The timing of the completion of this attraction is set to coincide with Disney World's 50th anniversary in 2021.
Who is ready to experience a new Tomorowland Thrill Ride? Stay tuned to Only WDWorld for more details and Disney World News! 0 comments to "Magic Kingdom Will Be Getting New Tron Attraction In Tomorrowland!"